The GeoPRISMS Data Portal was established in 2011 to provide convenient access to data and information for each primary site as well as to other relevant data resources. Reports below highlight contributions of data sets and field program information of interest to the GeoPRISMS Community. Many of the data sets are also available in GeoMapApp. Visit also the MARGINS Data Portal for information related to the MARGINS Program. The GeoPRISMS search tool provides a quick way to find GeoPRISMS Data using parameters such as keyword, NSF award number, publications, and geographical extent. The Data Management Tool generates a data management plan for your NSF proposal. The online form can be quickly filled in, printed in PDF format, and attached to a proposal. PIs can use an old plan as a template to create a new plan. There is also a tool developed by the IEDA team to help PIs show compliance with NSF data policies. The GeoPRISMS Bibliography includes more than 1140 citations, many tied to data sets. 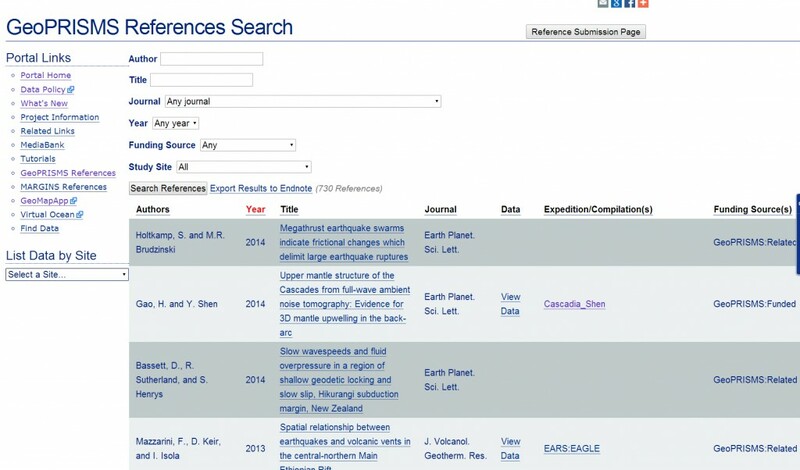 The references database can be searched by primary site, paper title, author, year, and journal. The citations can be exported to EndNote™. You can submit your paper for inclusion in the bibliography – just the DOI is needed! GeoMapApp is an earth science exploration and visualization application that is continually being expanded as part of the Marine Geoscience Data System (MGDS) at the Lamont-Doherty Earth Observatory of Columbia University. The application provides direct access to the Global Multi-Resolution Topography (GMRT) compilation that hosts high resolution (~100 m node spacing) bathymetry from multibeam data for ocean areas and ASTER (Advanced Spaceborne Thermal Emission and Reflection Radiometer) and NED (National Elevation Dataset) topography datasets for the global land masses. The web submission tool support PI contributions of geophysical, geochemical, and sample data. File formats include grids, tables, spreadsheets, and shapefiles. Once registered within the IEDA systems, the data sets become available to the broader community immediately or may be placed on restricted hold. Additionally, PIs can choose to have a DOI assigned to each submitted data set, allowing it to become part of the formal, citable scientific record. GeoMapApp is a free map-based data exploration and visualization tool that provides direct access to the GMRT compilation hosting high resolution bathymetry from multibeam data for ocean areas and ASTER (Advanced Spaceborne Thermal Emission and Reflection Radiometer) and NED (National Elevation Dataset) topography datasets for the global land masses. Lake Malawi multi-channel seismic reflection data collected during the 2015 SEGMeNT project (Shillington, et al.) Derived from Cascadia Initiative amphibious array instruments, an earthquake microseismicity catalogue (Morton, et al). More than 1,160 citations (many tied to data sets)! Submit your papers for inclusion in the bibliography – just the DOI is needed!